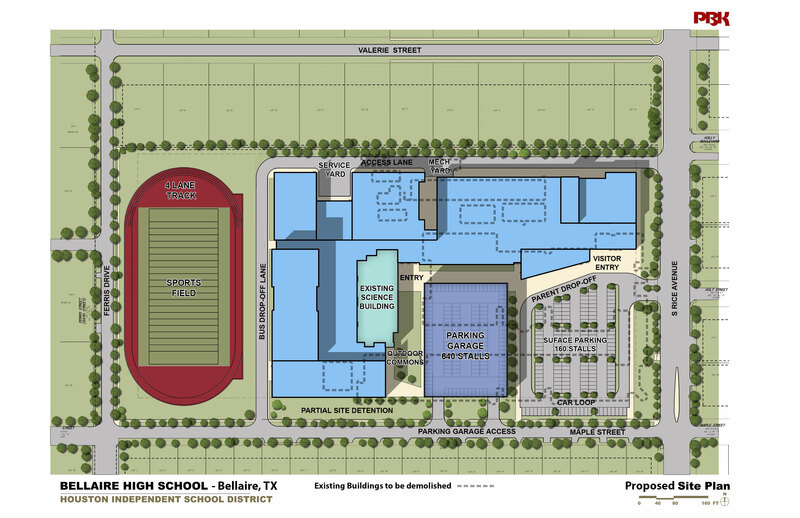 The Houston Independent School District is moving forward with a plan to rebuild Bellaire High School at its current location on South Rice Boulevard and has formally submitted applications to the City of Bellaire for required permits and variances. The first stop for the project proposal will be the city’s Planning and Zoning Commission on June 13, when the request for a Specific Use permit will be considered. In addition, the district is seeking variances from the Board of Adjustments that would allow construction of a building of approximately 434,000 square feet with up to four stories on some portions toward the interior of the site. The Board of Adjustments meeting is June 15. If the Specific Use permit and variances are approved, the project then could head to the Bellaire City Council in August for a public hearing and final vote. Specifically, the district is seeking to maximize the space on the current 18-acre campus by relocating the school’s baseball practice facilities to 6300 Avenue B at its intersection with Bissonnet Street in Bellaire — an HISD campus that previously was home to Gordon Elementary and Mandarin Immersion Magnet schools. The move would allow the architects to design a building that better meets the needs of the school and the neighbors, improve traffic flow around the school, and move all of the parking onto the campus, with a garage and surface lot. The main entrance and administrative offices would be off South Rice Boulevard to provide an obvious front door to the school. The school’s fine arts, career and technical education, ROTC, and athletic facilities would be located on the north side of the campus, buffered from neighbors on Valerie Street by an access road and line of trees. Students would remain on campus throughout the phased construction. The first phase would take up to 30 months and would include the construction of all classrooms, shared spaces, gyms, the pool, and the cafeteria area. The next phase would take about a year and include the parking garage, administrative offices, fine arts spaces, and athletic fields. The project budget includes an additional $9.5 million recently allocated from bond reserves by the Board of Education, which would allow the school to be rebuilt at a capacity of 3,100 students, maintain the current size of the school’s auditorium, and rebuild the pool. This entry was posted in 2012 bond, 21st century schools, District V - Sue Deigaard, High Schools, New schools, News and tagged 2012 bond, Bellaire, Bellaire High School, Bellaire HS, BuildHISD on June 12, 2017 by HISD Communications.